At allbranded you can create your own polyester lanyards, which you can use as promotional items. The eternal search for the key in your bag is finally over. Take a look in the allbranded online shop for suitable giveaways for your customers and business partners. We offer you personalised promotional items, which you can design according to your preferences. Show some colour and give away colourful promotional products to your target group. It will not only be an eye-catcher but also a reminder about your company, when they reach towards their keys. We from allbranded believe, that the there are many occasions for the ideal giveaway. Help your customers end the search for their keys. The lanyard is an everyday item. Most people use it to keep their items close to their body, so a world without lanyards is unimaginable. Keys, which have been lost or could not be found, have received a permanent position and are now always within reach. However, lanyards are not only made to carry keys. You can attach mobile phones, USB sticks or ID cards to them. Various uses, user value and an aesthetical look are only a few of the requirements a promotional item has to offer, to be able to advertise effectively and on the long run. No wonder, lanyards are one of the most popular promotional products in Britain. They not only fulfil all these requirements but have also a whole bunch of other benefits. A low unit price, a large advertising space and a long product life cycle are a few more benefits flat polyester lanyards have to offer. Use the printed lanyards as advertising material to increase brand awareness and give your target group a promotional product, which has great user value. The flat polyester lanyards have a large advertising effect. The history of the lanyard started in the 15th century in France. Back then, lanyards were part of the military uniform and were used to secure guns, swords and arrows as close to the uniform as possible. They were called ‘laniere’. Even in the following centuries, they stayed part of the uniform for decorative reasons. Even in countless western movies, lanyards are part of the official uniform of cowboys as well as government officials and are being used as a status symbol. Colours and patterns were not part of a corporate design back then, but instead were used to show the qualifications as well as the rank of the wearer. Only in the 70s, people have begun to use lanyards as promotional merchandise. This fact can be traced back to the constant use of lanyards at concerts and music events. Back then, they were being used to carry backstage tickets as well as ID cards. Nowadays lanyards cannot be amiss at any event anymore! The printed lanyards are effective promotional products and there are many reasons for that. First of all, they have a high user value. 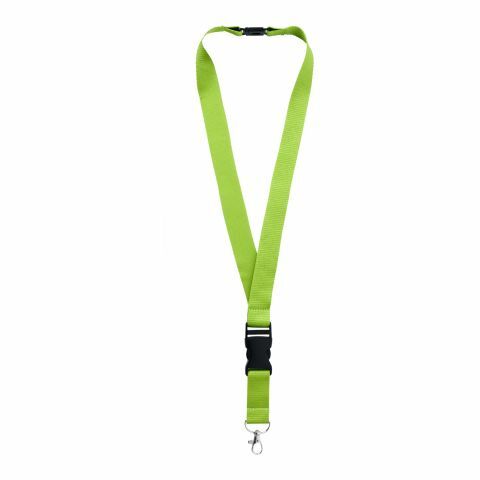 Polyester lanyards can be used daily and when printed with a logo or slogan, they draw attention towards the brand and through repeated use, customers remember it. As part of haptic advertisements, flat polyester lanyards can make an immense impression, by being touched by the user: Advertisements, which can be touched, generate memories faster and keep your company in the minds of your customers for a long time. A study showed that with 78% of promotional products, customers do remember the name of the brand and the company behind it. Moreover, lanyards have large advertising space, which can be used to display personalised messages. Not only are they suitable for every target audience, but they also reach different target groups with their promotional message. We at allbranded put great importance on the fact, that advertising with polyester lanyards will not be pushy but authentic. 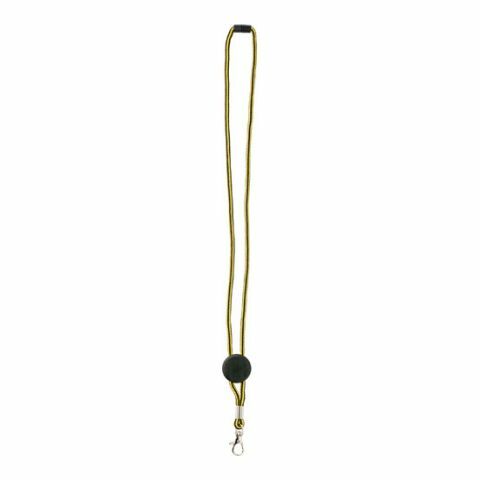 The lanyard wearer can decide on his or her own whether he would like to wear it as an accessory and become the brand ambassador. The personalised promotional product made out of polyester is ideal to make your circle of friends happy. A small gift will generate a lot of memories and will strengthen your relationships in the business world. Surprise clients and business partners with useful gifts. Improve your reputation and be constantly remembered without making any active advertising efforts. Polyester lanyards will multiply your advertising effect all on their own. Lanyards are, regardless of material, a perfect promotional product. But why should you still trust in polyester? Chemically speaking, polyester is a polymer with an ester chain as the main chain. We know it as plastic material, which can be used for many different things. The plastic fibres are the most known synthetic fibres worldwide. They have been used since 1947 in the clothing industry, mostly as part of a mix, consisting of 55 % polyester and 55 % wool. For your lanyards, polyester has many good characteristics to offer. They have high light and weather resistance, are easy to care for and they keep their shape. Promotional products made out of polyester are also almost non-flexible, which will not damage the print in any way. The tear-proof polyester lanyards fulfil all requirements for an advertising effect, which will last for years to come. In general, our printed lanyards are 90 cm long and have a half-twist at the end, so they can lay flat against the body. The allbranded online shop offers lanyards with a width of 10 to 25 mm. 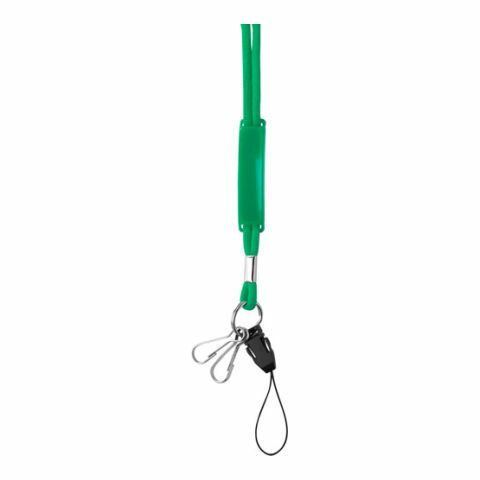 Additionally, the integrated clip made out of metal or plastic is the perfect link to carry keys and ID cards. 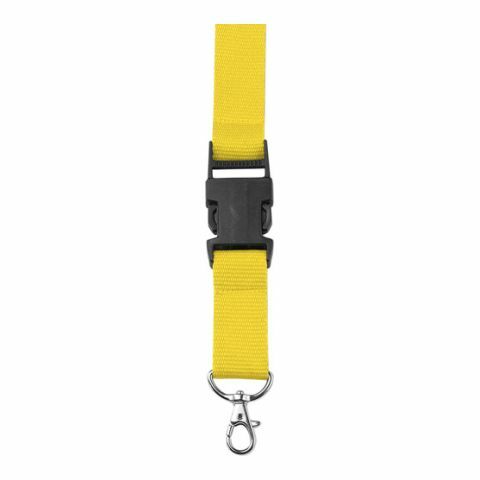 For safety reasons, every lanyard will have a safety clip, which serves the purpose of preventing asphyxiation and in case of high pressure, automatically opens itself. Regardless of your decisions, we can personalise every polyester lanyard. With a silkscreen print, you can add your company logo or slogan to the lanyards. Your creativity will not know any boundaries when it comes to decorating your lanyards. With our pantone colour-matching assistant, you can choose from thousands of colours, matching your corporate design. The promotional experts at allbranded will advise you on every question you might have and help you with the design and the choice of your lanyards!